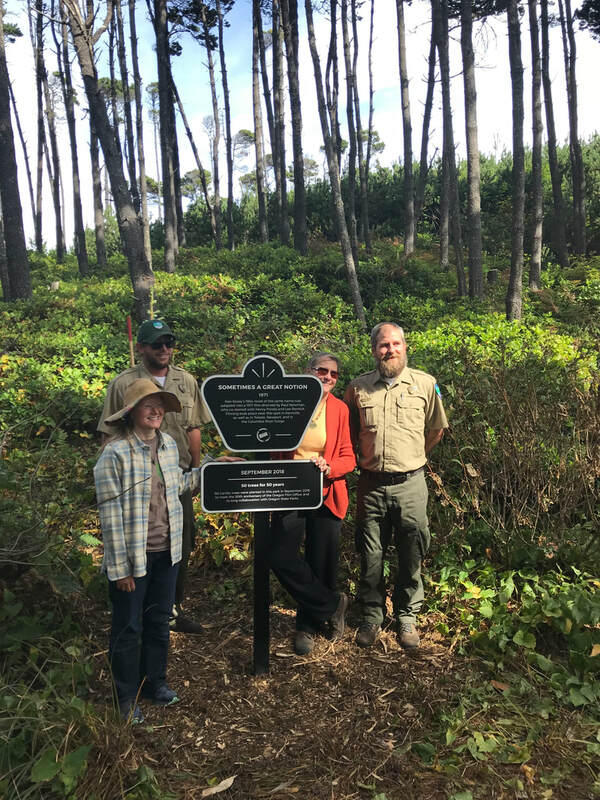 In September 2018 the first Historic Oregon Film Trail sign was installed in collaboration with Oregon State Parks in Gleneden Beach. The sign celebrates the 1971 production of the Paul Newman film based on Ken Kesey's novel "Sometimes a Great Notion" which filmed on nearby beaches and at a house on the Siletz River only a few miles away. In December 2018 and January 2019 the first small group of signs was placed in various spots around Astoria to mark and celebrate the productions of "Short Circuit," "Kindergarten Cop" and, of course, "The Goonies." One sign in particular is positioned at the East End Mooring Basin near the Astoria Riverfront Trail to give an alternative view of the “Goonies House” in an effort to eliminate trespassing on the hill of the privately owned residence. While the sign signifies a location for that viewpoint, the sign copy shares information about the nearby Astor Elementary School which was featured in "Kindergarten Cop." The lesser-known Alameda Park offers a great viewpoint of the Astoria-Megler Bridge and it is the topic of the "Short Circuit" sign located there. The sign for "The Goonies" is located by the Oregon Film Museum and speaks to it and the Flavel House’s roles in that film.